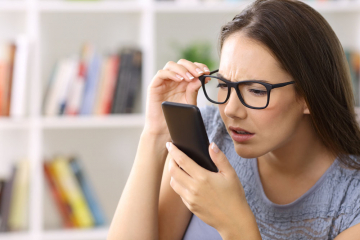 Does using a digital device cause eye strain? We live in a world where technology dominates; it has had a profound impact on our day-to-day lives as we use computers, smartphones and tablets for work, to communicate and to find out information. These new habits have changed the way we interact with traditional media; many now use smartphones instead of a newspaper to find out the latest news. This has resulted in physiological changes; our behaviour and even posture is impacted. Often associated with this spike in usage is the onset of tired or ‘strained’ eyes. You have probably experienced it yourself after a day at the office, or after scrolling through social media for too long. This is often known as visual fatigue, or computer vision syndrome. Eye strain, or visual fatigue, is likely to come from looking at pixelated screens. The pixels on a screen constantly refresh, and our eyes must constantly re-focus to see clearly. It is simply a lifestyle change that our eyes are trying to adapt to due to the explosion in the use of digital devices over the last decade. How do digital devices affect your eyesight? Previous single vision lenses were designed to look at distance objects through the centre of the lens meaning that we have to position ourselves to see near objects clearly which could result in neck and shoulder pain. A 2013 study looked into the impact of digital technology on posture and behavioural trends. The results confirmed a modification of postural behaviour relative to traditional media. When using digital devices, it was revealed that posture is stable and almost rigid. Devices like smartphones, tablets or e-books require our eyes to look down more and viewing distance are closer than other traditional mediums such as paper. Our eyes have to focus more intensively and have to repeatedly adjust as we look from one screen to another, at different distances. This has had an impact on our visual needs. A further study on computer vision syndrome looked into today’s visual demands and suggested that lens design and eye examination processes must be modified to meet these requirements. Eyezen lenses can support visual efforts and therefore prevent or reduce eye strain. This can lead to improved comfort and sharper vision. Optimised for everyday needs, Eyezen lenses can be worn even if you don’t need a prescription. Wearing these lenses can stop eyes from working so hard especially when using digital devices, whether it’s for social or work purposes. Find out more about Eyezen lenses at one of our partnered local opticians.